Hourglass Escapes has announced an official Evil Dead 2: Dead by Dawn Escape Room. The event will take place this summer in Seattle, Washington. 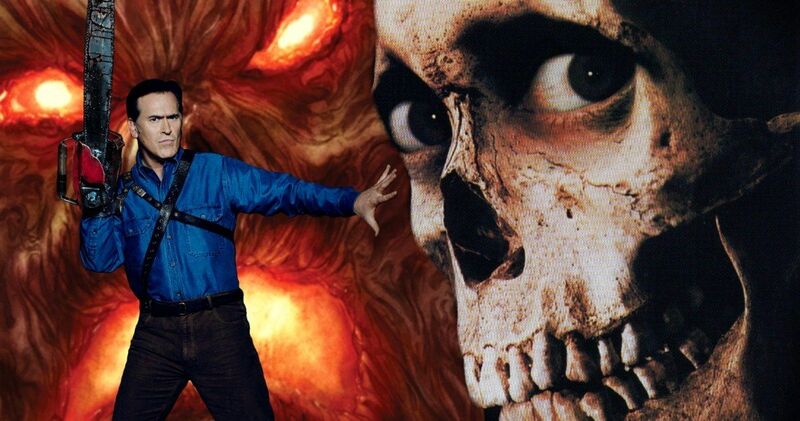 Hourglass Escapes is offering a brand-new way for horror fans to immerse themselves in the world of the Evil Dead. While this is definitely some very exciting news, the advertisement that Hourglass Escapes came up with is pretty awesome on its own. It’s made to look like an old tattered VHS tape box that gives away the pertinent details. Evil Dead 2: Dead by Dawn Escape Room players will be able to enter that all-too-familiar cabin in the woods and they will have until dawn (or 60 minutes, whichever comes first) to find the Kandarian dagger and destroy the book of the dead before the evil dead swallow their souls. Fans of the classic horror comedy can expect Deadites, chainsaws, a very strange deer head, a chained-up cellar door, and plenty of horrifying surprises. That pretty much sounds like the ultimate way to kill 60 minutes. Universal Studios offers up horror mazes for their annual Halloween Horror Nights, but Hourglass Escapes promises that this will be a much different affair. The Evil Dead 2: Dead by Dawn Escape Room players will play in active role in trying to escape, instead of cruising through a maze that has one way to go. Hourglass Escapes co-founder and creative director Seth Wolfson had this to say about the new escape room. Speaking of Halloween Horror Nights, Seth Wolfson used to be an animatronic artist for Universal Studios Orlando and he has done wax work with Ripley’s Believe It or Not. Evil Dead 2: Dead by Dawn Escape Room seems like a lot of love a care is going into making it the best that it can be. With that being said, horror fans from all over the country will probably start booking trips out to Seattle to get in on the Evil Dead 2 fun. Related: Watch 4 Clips From the Evil Dead 2: Dead by Dawn – Book Of The Dead 2 Edition DVD! Outside of the announcement that the Evil Dead 2: Dead by Dawn Escape Room is happening this summer, there aren’t too many other details. Horror fans who are interested in more information are urged to check out Hourglass Escapes to get updates in regard to specific dates, time, and pricing information. While we wait for more details, you can check out the awesome artwork promoting the escape room below. Coming to Seattle this Summer!